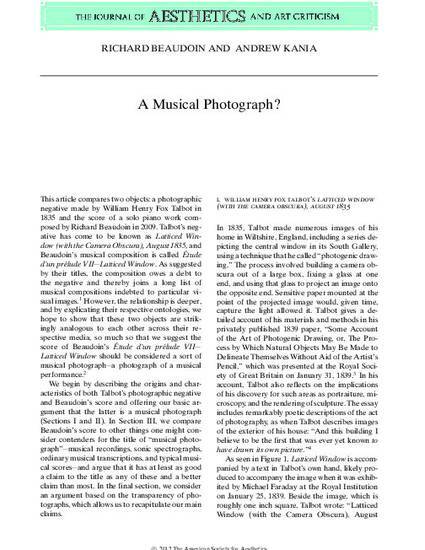 This article compares two objects: a photographic negative made by William Henry Fox Talbot in 1835 and the score of a solo piano work composed by Richard Beaudoin in 2009. Talbot’s negative has come to be known as Latticed Window (with the Camera Obscura), August 1835, and Beaudoin’s musical composition is called Étude d’un prélude VII—Latticed Window. As suggested by their titles, the composition owes a debt to the negative and thereby joins a long list of musical compositions indebted to particular visual images. However, the relationship is deeper, and by explicating their respective ontologies, we hope to show that these two objects are strikingly analogous to each other across their respective media, so much so that we suggest the score of Beaudoin’s Étude d’un prélude VII—Latticed Window should be considered a sort of musical photograph—a photograph of a musical performance.